1. Tenderize the pork by placing the pork with the vinegar and water in a pot. There should be enough vinegar and water in the pot to submerge the pork. Set the flame on low and let it simmer for about 45 minutes to 1 hour. About 10-15 minutes into the simmering process, remove the cover and check for scum. The pork will produce a foamy scum on top of the pork way before it gets to boiling. Scrape off the scum and discard. Cover the pot again. Check the pork for tenderness about 45 minutes in, and keep checking every 15 minutes to test for desired tenderness. 2. 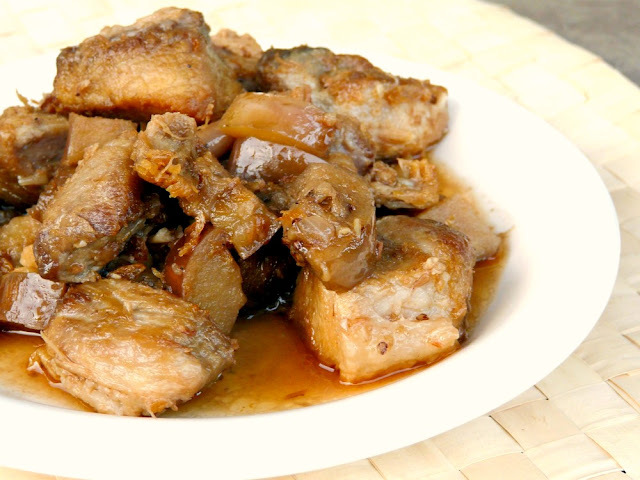 Once tender, remove the pork from the pot and place it in a strainer to drain the remaining juice. When cool to the touch, cut off the skin and discard but leave the fat attached. 3. Heat up about 1/4 cup of oil and brown the garlic. Set the garlic aside. Using the same pan, add the remaining oil and heat it up on medium flame. Carefully lower the pork into the pan. This is why you want to drain the pork, because water from the pork and hot oil will cause a lot of splattering. Be warned that even though the pork has drained, it will still cause splatter and popping. If you are a novice cook, wear long sleeves to protect your arms. I wear eyeglasses to protect my eyes, and make sure you stand away from the stove when you do this. Let the pork sit for about 5 minutes and turn every so often until you get an even browning. You might have to add a bit more oil if the bottom of the pan gets dry. 4. Once you get an even browning, turn off the flame. Let the remaining heat finish off the cooking process. Remove and discard excess fat. Add about 1/3 cup of the vinegar and water mixture you boiled the pork in. Add the cooked garlic and bagoong. Because of the remaining heat, vinegar and water will sizzle and evaporate. If this happens, just add a bit more until you get the desired amount of sauce. Adjust the bagoong to taste as you go. Serve with lots of rice. Barrio Fiesta or Kamayan are two famous brands of bagoong (shrimp paste). Cooked bagoong is dark in color like this one. Uncooked bagoong is pink. I prefer to use cooked bagoong from either of these two brands. Here's the pork getting an even browning. This is how brown you want it. It gives it enough crunch on the outside and tender meat in the inside. I am almost sure Tony Bourdain would love this. Tony, just let me know, and I will gladly make this for you.